David O’Blenis’ 60 years of flying aircraft has been a thrill at every thrust. It was a lifestyle made more delightful when airplanes and the magic of flight came to his village. 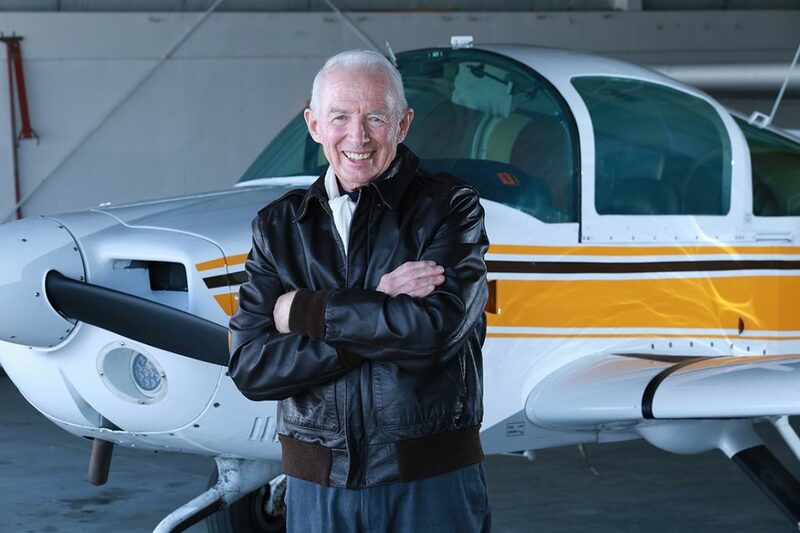 It was flight that was to determine the direction of his life through a distinguished career in the Royal Canadian Air Force and as a civilian pilot and instructor. He had his first encounter with airplanes when he was just three years old. At that time, his home village of Salisbury, New Brunswick, was one of 231 locations across Canada selected to be part of the British Commonwealth Air Training Plan. The BCATP, administered by the government of Canada, under the command of the Royal Canadian Air Force, was set up to train Allied air crews during the Second World War. That thought stayed with him until he was old enough to join the Royal Canadian Air Cadets. Run out of the regional high school, the local squadron was headed by the school’s shop teacher, who happened to be David’s next-door neighbour. 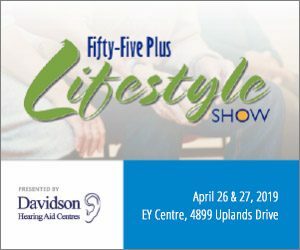 After serving for 37 years in the Canadian Forces, accumulating such prestigious decorations as Commander of Military Merit and the Legion of Merit and various other accolades along the way, he moved into civilian life, heading such major corporations as Raytheon Canada, Allen-Vanguard Canada, Allied Signal and Honeywell for the next 15 years. But he balks at discussion of his career. Those opportunities included a graduate degree in engineering, teaching at the Royal Military College in Kingston for 11 years, and increasingly senior positions in the air force, most notably three years as the commander of Canada’s fighter and surveillance forces and two years as the deputy commander of the North American Aerospace Defense Command (NORAD) in Colorado Springs. David adds that he believes that luck eased his transition into senior positions in industry after completing his years of service in the air force. 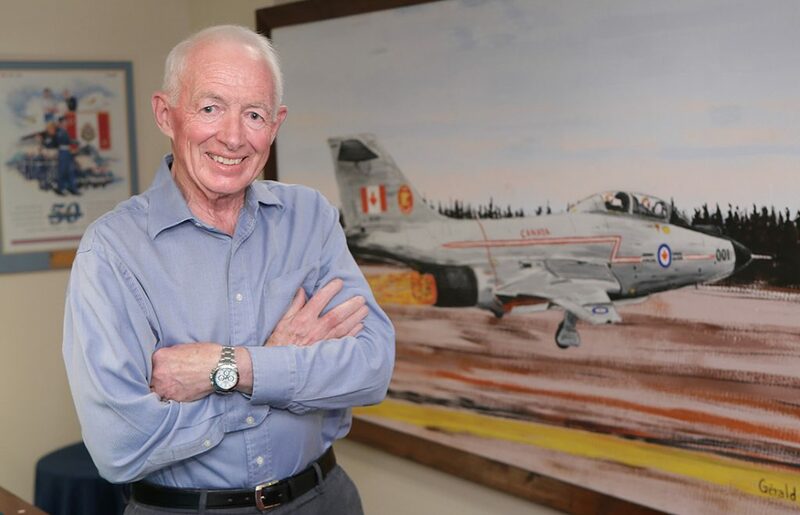 David stands in front of an image of a CF-101 Voodoo Supersonic by Gerald Grenier, a graphic artist of 410 Squadron. The Canadian Air force flew these aircraft as fighter interceptors for the defence of North America against the Soviet Union Bomber Force for more than a quarter-century of the Cold War. The main Canadian Airbase, “Home of the Voodoo” was Bagotville, Quebec. All RCAF training on the aircraft was conducted at 410 Squadron, which was also called the “RCAF All-Weather Fighter Training Squadron”. David commanded 410 Squadron for four years near the end of the Cold War in the 1970s and 1980s. The aircraft was a big, powerful fighter (64,000 lbs. ), capable of climbing from the runway to 30,000 feet and above in less than five minutes. In David’s words, “she always provided an exciting ride.” The aircraft that David flew was tail number 002. It now sits on a pedestal in the Canadian War Museum in Ottawa. He mentions in passing that he was awarded an honorary doctorate for helping to establish and provide ongoing support for the University of New Brunswick’s Milton F. Gregg Centre, which leads academic studies on war and society, but quickly returns to talking about the importance of flight throughout his life. His flying experience includes anti-submarine maritime patrols, air defence and tactical fighter operations, as well as Ministry of Transport licensing as a private and commercial pilot, a flight instructor and a designated flight test examiner. 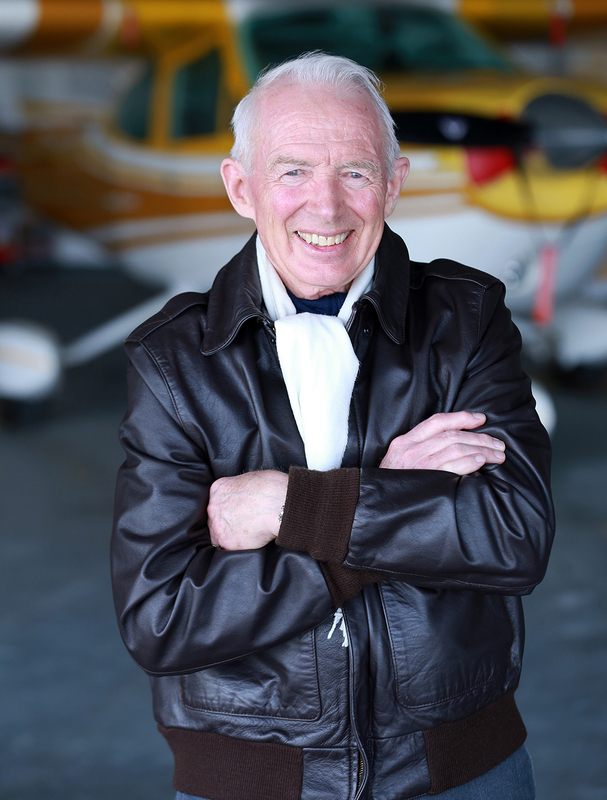 Much of the time, he has been teaching others to fly, initially at the various points at which he was stationed, while he was in the air force, and, for the last 12 years, as the chief flying instructor at the Smiths Falls Flying Club. 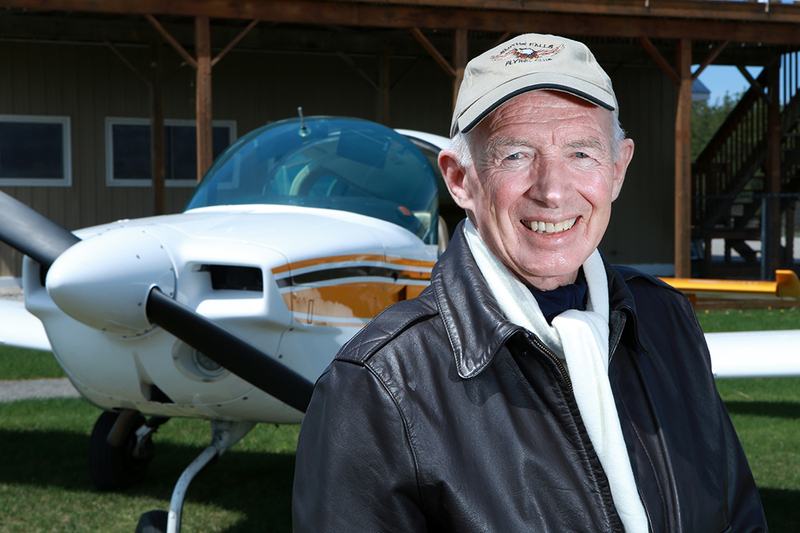 For the last 12 years, David has devoted much of his time to the Smiths Falls Flying Club. As well as having served as its president three times and continuing to be the club’s chief flying instructor, he initiated a video and started a museum about the club and the airport. As flying remains a key part of his life, it is fitting that his career should come full circle in a small town complete with the magic of flight, as demonstrated by small planes. The airport, which is registered with Transport Canada, is operated by the Smiths Falls Flying Club and is run entirely by volunteers. In the 1950s, a small company formed by a group of Smiths Falls residents leased a hay field east of the town for $200 a year. When the owner died, her heirs sold them the property for $3,000. They also acquired land around the flying field, in time to land an aircraft on July 6, 1959. When the Smiths Falls Flying Club was formed in 1960, the company turned the airport over to the club. Over the next 12 years, the club expanded, going from one hangar to 16, and from one aircraft to 20, including two club-owned training aircraft. In 1978, the club sold the airport to the Town of Smiths Falls and Montague Township for $1, so that the airport became eligible for a grant from the federal government to build a paved runway and taxi strips. The club now has 250+ members, 50 hangars and accommodates 150 aircraft. The Smiths Falls-Montague Aviation Museum was established in 2010. Information supplied by longtime club member Ralph McElroy. The Royal Canadian Air Cadets is a nationwide youth program for 12 to 18-year-olds, administered by the Canadian Forces. Together with the sea and army cadet cadres, it is the largest federally funded youth program in the country. The first air cadet squadron was established in 1941 to train young men for service in the Second World War. Since 1975, legislation has been in place to include female cadets. Membership now stands at approximately 23,000 in 456 squadrons across Canada. One in five private pilots in Canada is an ex-air cadet, and two-thirds of commercial and airline pilots began their careers as air cadets. The Order of Military Merit, founded in 1972, recognizes exceptional service among members of the Canadian Forces. The OMM is administered by the Governor General, on behalf of Her majesty Queen Elizabeth II. The Legion of Merit is a military award of the United States armed forces, given for exceptionally meritorious conduct in the performance of outstanding services and achievements. It is issued to military and political figures of foreign governments, as well as to members of the uniformed services of the U.S. The Royal Military College of Canada was established in 1876. Based in Kingston, it is the only federal institution in Canada with degree-granting powers. The RMC mission is to educate, train and develop officer cadets for leadership careers of effective service in the Canadian armed forces. One part of the RMC program, the Regular Officer Training Plan, is a conditional scholarship offered to selected applicants. In addition to a university education, officer cadets receive military training, occupation training and second language training and a career after graduation.